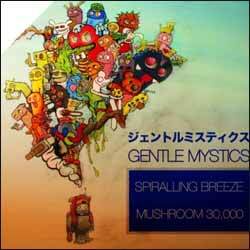 London 9-piece band Gentle Mystics release their debut single 'Spiralling Breeze / Mushroom 30,000'. The single comes from their self-titled album Gentle Mystics which will be released this autumn (2011). Gentle Mystics are an interesting band, and these two singles show how diverse their musical tastes are. 'Spiralling Breeze' is an interesting release, Noemie Ducimetiere's vocals are haunting and the cliched French cafe feel to the opening of the track is an amusing touch. 'Mushroom 30,000' has a segment that seems to be inspired (or has ripped of) an Internet viral song that was doing the rounds about five years ago - the lyrics to which went: "Badger, Badger, Badger, Badger, Mushroom, Mushroom." This too is an amusing track that throws in computer game sound effects. Both tracks are interesting and I'm looking forward to hearing more from this group in the future.